Are you thinking about getting an Irish Setter? If you are looking for an enthusiastic, friendly dog that loves being around people, this breed may be the perfect choice for you. Irish Setters are not well-suited to serve as watchdogs, but they do make energetic family pets and good bird hunting dogs. This distinctive member of the Sporting Dog group has long been the pride of Ireland. The breed was recognized by the American Kennel Club (AKC) in 1878. It is a mixture of several types of Setter and Spaniels mixed with Pointer. Setters were originally bred to provide assistance to bird hunters and are still just as popular as birding dogs as they are as family pets. The rich, solid mahogany coat of the Irish Setter is easily the breed's most recognizable feature. Setters tend to weigh between 60 and 70 pounds when full grown and reach a shoulder height of approximately two feet. The Irish Setter is well known for having high energy and and an exuberant personality. Unless you give these dogs plenty of space and activity, all that pent up energy will be funneled into other, less desirable behaviors. If you're into physical activity and you're looking for a canine companion to share it with, this dog may be the right breed for you. However, if you want a quiet companion to share your evening with after a day at the office, this breed isn't right for you. Irish Setters are always looking for someone to have a good time with, and they are not all that particular about who. Unlike many other breeds, these dogs do not tend to be wary of strangers at all. Because of this, they don't make good guard dogs. Irish Setters may be excitable dogs, but that doesn't mean they can't be trained. You simply have to use positive reinforcement methods instead of punishing infractions. In fact, this is plan you should follow when training any dog. You will need to exercise great patience and consistency to enjoy success with basic training such as house breaking, but it can be accomplished. The sooner you start training your dog, the better. Most Setters don't begin to settle even slightly until two to three years of age, so early training is a must. 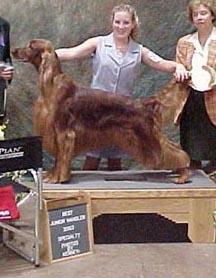 Every Irish Setter should be taken through obedience training. This is essential to gain and maintain some control over your pet, and training should then be reinforced positively on an ongoing basis. Agility training is a great activity for Irish Setters and their owners to get involved with. This kind of training shows this breed off at its best. Irish Setters can also be trained to serve as pointers in the bird hunting field; after all, this is what the breed was originally created to do. Irish Setters actually require a surprisingly low amount of grooming. A weekly brushing, especially around the fringe areas and foot feathering, and a monthly bath will do in most cases unless you take your dog into the fields. Then, frequent brushing and extra flea and tick maintenance will be necessary. Because of their large size, many owners opt to take this breed to the grooming shop instead of attempting bathing on their own. A healthy Irish Setter can be expected to live about 14 years. However there are some health issues that have a tendency to affect this breed. Check out the results of the 2003 health survey carried out by the Irish Setter Club of America to learn more about health issues in the breed. Is an Irish Setter Right for You? Are you ready to bring an Irish Setter into your home? If you want a puppy, you'll need to locate a reputable breeder. You can expect to pay between $500.00 and $800.00 for a well-bred pup with a health guarantee. There are also rescue Setters available for adoption. The Irish Red and White Setter Association, the U.S. parent club for the breed, is a great resource for finding reputable breeders and locating rescue dogs available for adoption.